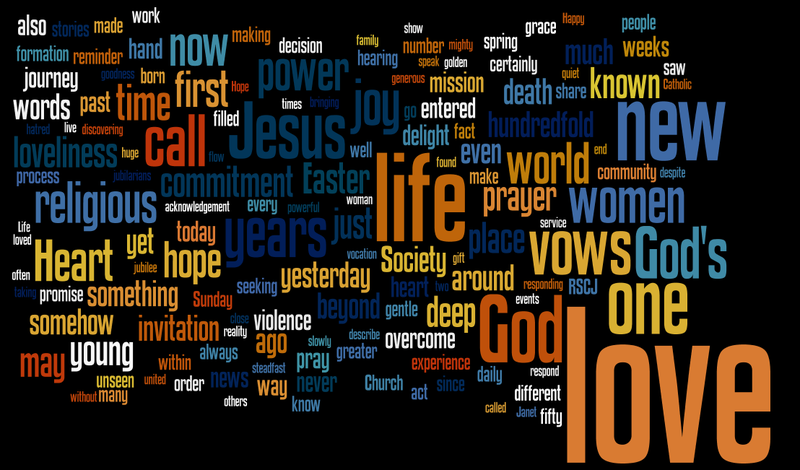 Call, vows and commitment seem to have been dominant themes this month, following on from Easter. And during the month I was also directed to this video of a Dominican friar singing George Herbert's The call. The special arrangement of Vaughan Williams' setting was composed by a student in our house, and two of his friends - who have also stayed here - were the director and part of the film crew. It seems a fitting way to round off a month of call and response! But for those who - like me - like their words, there's also a Wordle of this month's posts below. Usually I play around with Wordles, experiment with fonts, layout and colours, but on this occasion I've stayed with the first thing that appeared after I clicked "create". For me it has tremendous dynamism; I see a wave of big love wanting to whoosh off the page, taking everything else with it! Normally I fit images into the margins, but this Wordle definitely needs to be big and uncontained: yes, the end result looks somewhat untidy, and encroaches into other stuff, but that's what can happen when you let big love come whooshing into your life! What words and phrases can you see in here...? Please listen to this lovely gospel songs at https://www.youtube.com/watch?v=h408VIuz-5s and kindly share with everyone. GOD BLESS YOU.